2019 Porsche 911 GT3 GT3 Touring Ed. 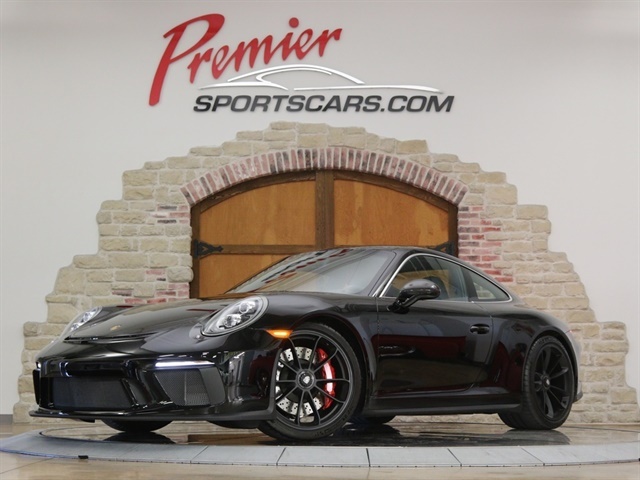 I am interested in this 2019 Porsche 911 GT3 GT3 Touring Ed. Email me new listings for Porsche 911 GT3 GT3 Touring Ed. Options: -Black -Leather Interior in Black w/ Cloth Seat Centers -Touring Package -Extended Range Fuel Tank, 23.7 gal. -Seat Heating -Front Axle Lift System -6-Speed GT Sport Manual Transmission -LED Headlights w/ Porsche Dynamic Light System (PDLS) -Leather Interior Stitching in Red -BOSE Surround Sound System -Sport Chrono Stopwatch Dial in White -Interior Trim in Carbon Fiber i.c.w. Leather Interior -Adaptive Sport Seats Plus (18-way) -Auto-Dimming Mirrors w/ Integrated Rain Sensor -Chrono Package w/ Preparation for Lap Trigger -Door Sill Guards in Carbon Fiber -Wheels Painted in Satin Black -Instrument Dials in White -Upper Housing of SportDesign Exterior Mirrors in Carbon Fiber -Sun Visors in Alcantara -Seat Belts in Guards Red MSRP - $ 168,720.00 Car comes complete with owners manual, spare keys, original window sticker, and is in all original, accident free condition. Call Chris Courtney Today at (888) 319-3098 or Text (888) 319-3098 . I am interested in this 2019 Porsche 911 GT3 GT3 Touring Ed. that recently sold on duPont Registry.